These faux rubber thongs (flipflops) were purchased in Hawaii (island of Kauai). They have a vinyl-type synthetic composite foot strap and toe divider strap. The thong is covered in clear plastic. 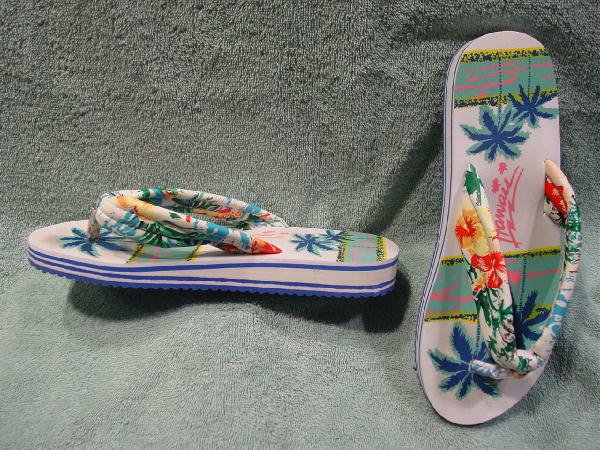 The nonskid sole is in a bright blue and the insole and straps have an island design in blues, greens, red, pink, yellow, peach, and white, with Hawaii written in dark pink letters. There are some toe imprints, especially on the right flipflop. They were worn three times.